Bring cozy comfort and stunning style to every bed in your home with these fun and festive pillow shams from Collections Etc. With intricate patterns, bright colors, classic prints and exclusive designs, our pillow shams can add a big dose of personality to any space. No matter your style - Floral, country, patchwork, or something else - We’ve got a pillow sham that’s just right for you. If you’ve been looking for that special finishing touch for your bedroom or guestroom, then you’ll surely be inspired by the endless options of affordable pillow shams at Collections Etc. While choosing a lovely bedspread is important, don’t forget that pillow shams can be just as effective when it comes to adding visual intrigue to any bedroom. We love using pretty pillow shams to complement a certain theme or celebrate a special occasion. 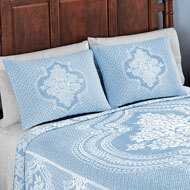 In fact, you may even want to use a neutral bedspread so you can change up the shams to fit the season. How about some cute shams in autumn shades of red, orange and brown for the fall season or some festive styles for the holidays? Pretty florals and other prints can also be mixed and matched with neutral bedding to provide lively looks throughout the year. Pepper in some plush throw pillows for a luxurious, layered look. With our budget-friendly prices, pillow shams can become an essential part of your decorating strategy. We’re delighted to offer good-looking standard pillow shams at a wonderful value. 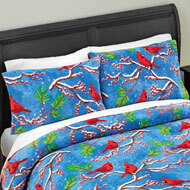 Pillow shams are great for adding vibrancy to your bedroom, but don’t forget to prioritize comfort. It is your sleep and relaxation sanctuary, after all. At Collections Etc., we believe your bedroom can be a peaceful retreat while still being just as tasteful as the rest of your home. Sham fits standard size pillow. 26" x 20". Shams sold individually. Machine wash. Polyester and cotton; imported. Choose Blue or Natural. Matching sham fits standard size pillow. 26" x 20". Shams sold individually. Machine wash. Polyester; imported. Matching sham fits standard size pillow. 30" x 20". Machine wash. Polyester; imported. Matching sham fits standard size pillow. 26" x 20". Shams sold individually. Machine wash. Cotton and Polyester; imported.